You can either make a booking directly on this website by using the "check availability box" to the left. Some of our homes do not have the option to book online for a variety of reasons. You can call our office at 800-853-5983 24/7 and a receptionist will be glad to help you or you can click the 'Live Chat' button on the home page between the hours of 9am and 5 pm PST Monday-Friday. The booking process is fairly simple. After you decide on the dates and property you want, you will reserve the property with a $559 charge to a credit card of your choice. This amount includes a $500 fully refundable security deposit, for some homes, and a $59 Security Deposit Insurance plan. You then receive a rental agreement via email. You need to sign and initial the agreement and get it back to us by regular mail or email. Processing fees can be waived if paying remaining balance by any other means than credit card. Please let us know if this is what you would like to do. Full payment is due 30 days prior to your arrival and once we receive the rental agreement and full payment for your stay, we send instructions to get into the home. Most of our homes have digital locks so you will be emailed a code for the lock via email. Once you get into the property with the code, you can change the code to anything you want with the instructions we provide. That's it! We offer several homes, some of which allow pets and some do not. You can either look at our properties online by clicking on the "vacation rentals" tab above and see if the home you are looking at allows pets. You can also call our office at 800-853-5983 and a receptionist would love to help find a home that is just right for you and your pet. Homes that do allow pets will have an additional daily charge for this service. The fee will vary from home to home. Please call us to find out more! Starter kits are small quantities of the the things most people need when they are on vacation. Our starter kits include 2-3 rolls of toilet paper in each bathroom, a roll or two of paper towels, travel size soaps, conditioners, and shampoos, laundry detergent, etc. Anything you may need above these items is your responsibility. You can cancel your reservation and receive a full refund minus a $50 cancelation fee as long as there are more than 30 days before your arrival. If you cancel your reservation less than 30 days before your arrival, you forfeit all money paid. We will do our best to rerent the home and will give you the difference of what we rented the home for minus what you paid if we can rent the home. Vacation homes have so many benefits that other forms of lodging do not have. 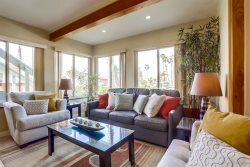 Much more room, common areas so you can relax with family and friends, fully equipped kitchens, and private pools, hot tubs, and outdoor kitchens are featured in many of our San Diego vacation rentals. Many people that stay in a vacation rental of ours say they will never stay anywhere else! Do I need to purchase Vacation Rental Insurance? How many of us could afford to lose the non-refundable part of our trip if something unexpected happened? Your vacation investment is protected when you buy CSA Vacation Rental Insurance, which covers you for trip cancellation, delay, and interruption. Pacific Coast Vacation Properties, Inc. has partnered with CSA Travel Protection to provide you with this important insurance and we highly recommend that you purchase the protection to safeguard against the unexpected. We all want the trip we’ve planned to be the vacation of our dreams. No one wants that dream to turn into a nightmare, but unexpected events can happen! Troubles can occur when you least anticipate them, illness...medical emergencies...delayed flights [snow storms] and other severe weather. Forcing you to cancel or interrupt your trip, lose your vacation investment, and incur unplanned expenses. Securing this protection will provide you with the assurance that damage which is caused inadvertently by you or a travel companion, will be covered under the plan up to a maximum limit of $3,000. We require each renter to purchase this insurance for each rental. At only $59, it is a small price to pay for peace of mind. No need to worry anymore if a glass, chair, or even a TV breaks while on vacation. Security deposit insurance has you covered! Why do we, sometimes, require both a security deposit and security deposit insurance? Both a security deposit and a security deposit insurance policy may seem excessive but it covers both the owner of the home and you, the renter, against all foreseeable damages Security deposits are only required at some of our homes and usually by owner's request. Most things are covered by the security deposit policy but some items are not. For example, because all of our homes are non smoking, out security deposit policies don't cover any smoking damages to the home. In the unlikely event we discovered a cigarette burn in a couch, the policy would not cover this damages. Your security deposit is required and would fill the gap to fix or replacement the damaged couch. Other things that aren't covered by the security deposit insurance policy include fines for noise violations, extra charges for excessive cleaning in the property, and fines for failure to take trash out on designated dates. Additional deposits may be required for special situations when renting homes such as larger groups or if renting to underage groups. Please feel free to give us a call for more information!